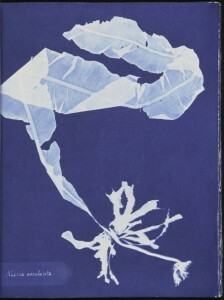 When a photographer is asked about how does a cyanotype looks, he or she will probable describe it as: a blue surface where there’s a silhouette in white. Probably this silhouette will be a flower, a leaf, a plant. 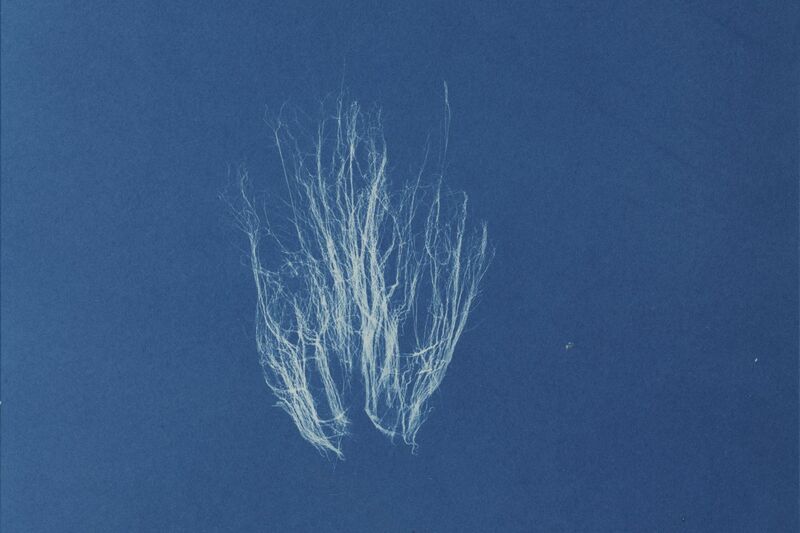 This iconic image, embedded in the DNA of any serious photographer, mainly in those who have done research in analogue photography, was made by a woman: Anna Atkins (Tombridge 1799- Kent 1871). 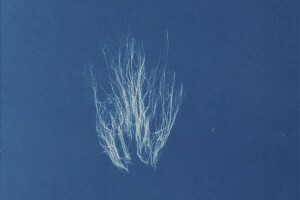 Anna Atkins was born in a family from the British high bourgeoisie, growing up in the contradicotry victorian society. Her father, John George Children, was restless multidisciplinary scientific. A mineral (Childrenite) and a snake bear his name. Her mother never recovered from the birth and died shortly afterwards. Mr. Children educated his daughter in an intellectual environment not usual those times. From a young age she felt the itch of natural science to which she devoted all her life. Her marriage didn’t stop her of pursuing with her researches, which wasn’t also common. Anna, seduced by botanics, was very good at drawing. She did detailed drawings and engravings of flowers and plants, but even with her virtuosity, she could not accurately capture the fine details of the elements that she was studying. In 1842, John Herschel, a family friend, invented the cyanotype process. A direct positive photographic process where the sensitive solution is a mixture of potassium ferricyanide and ammonium citrate. Anna, with a visionary boldness, realized that this process could help her with her problems in order to contact print the delicate plants. Then expose them to the sun and wash them. She succeeds. 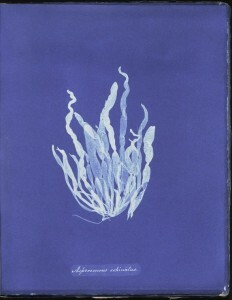 One year later she publishes British Algae: Cyanotype Impresssions. This book is catalogued as the first published book that uses a photographic process for the illustrations, and it represents a milestone in the history of photography. In that book alguae that were picked by she or by her friends are reproduced. Each book, or rather each photo album, has around 400 prints, most of them are 26×20. Obviously each book is different. There are not two exact prints as Anna uses cyanotype via contact prints. There’s no negative. 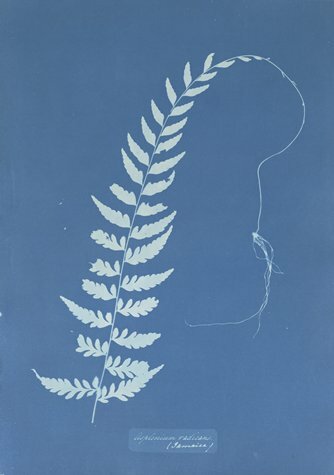 Some people say that she tried to reproduce her plants with calotypes but the results weren’t good enough. In this link of New York Public Library we can see the copy of Atkins book that they keep. 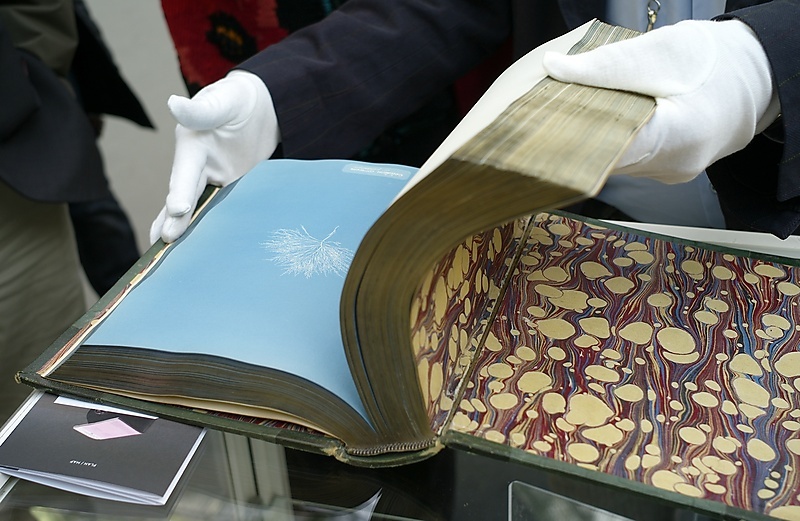 At the Royal Society in London, they have a 403 pages copy with 389 prints. This one is considered to be the only existing copy of the book as Atkins conceived, original without future manipulations. Imagine the enormous work. Her work was immediately appreciated by her contemporaries, but vetoed in scientific societies as they didn’t accept women. Anna wanted to keep on with her collection and for the next editions she had the help of another woman: Anne Dixon, distant cousin of Jean Austin. They published in the 50s this two books of ferns and plants. 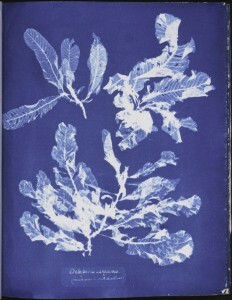 Anna Atkins, together with Anne Dixon, produced three different volumes of photographs printed in cyanotype between 1843 and 1853. Nowadays, 17 copies are preserved in different institutions, some of them incomplete, but all of them in good condition, based also to the fact that the papers were well processed initially. Atkins intention wasn’t to make an artistic work, but its important in art is evident. Not only photographic, modern art museums are very interested in getting her Works, as she also did collections of separate pictures. There’re works by her in the MOMA, in d’Orsay museu, among others. Her transcendence in other photographers whose intention is purely creative it’s obvious. How not to remember Moholy –Nagy and Man Ray who experimented a lot in techniques of photography without a camera. 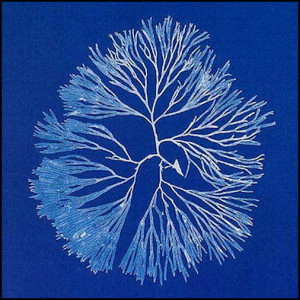 Viewing her pictures makes us thing about the think line that quite often separates artistic from scientific photography. 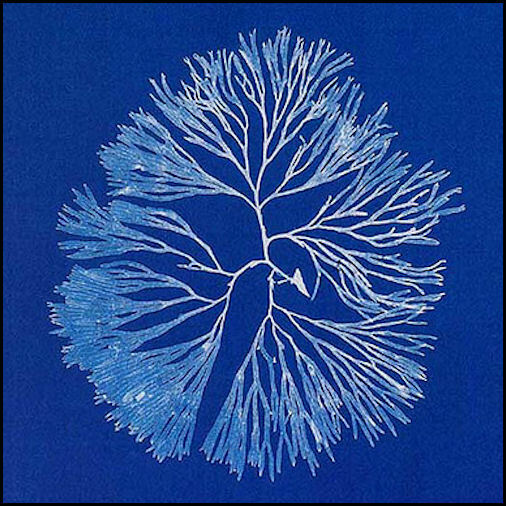 Photographical works taken under a scientific prism become art because who looks at them perceives them as such. Anna’s pictures are precise, but also beautiful, delicate, with an aesthetic sobriety sometimes overwhelming. They opened a whole new field of photographical experimentation, both in science and in art. When I watch at Atkins prints I cannot avoid thinking in the works of Karl Blossfeldt (1885-1932). He also took pictures of plants so his ornamental art students could copy the models from nature in order to use them in their crafts. This photographer didn’t have any artistic intention but when he was still alive got the attention of art galleries and artists. Even Moholy-Nagy exposed his pictures in an exhibition about Vanguardism in Stuttgart in 1929. 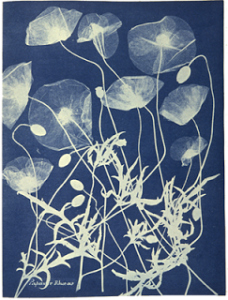 The intention of this article isn’t to teach the technique of cyanotype but to pay homage to this visionary in the world’s day of cyanotype. 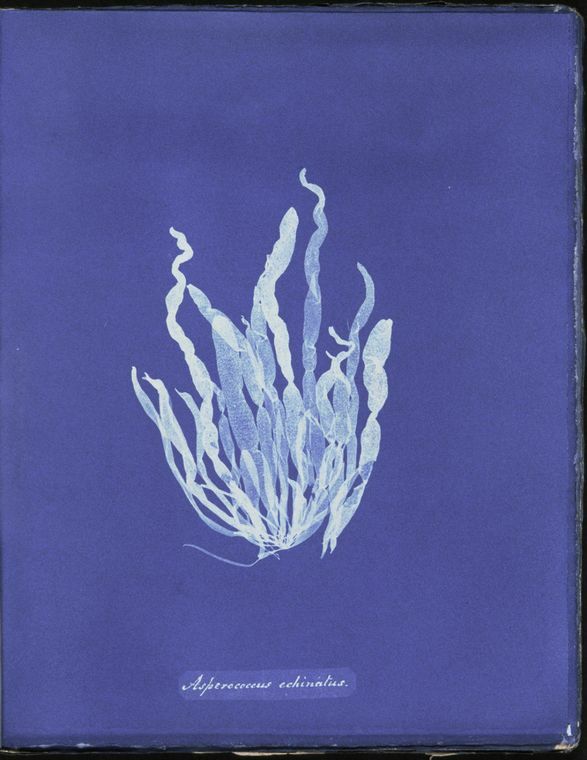 Anna Atkins pictures are in our imagination indelibly. She’s is not a pioneer, she is THE PIONEER. 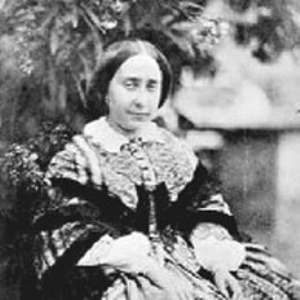 Alegría Lacoma Lanau. Huesca. September 2015.